Experience all the benefits of a RainSoft water treatment system! The Home Depot®, as their preferred water treatment provider. They chose RainSoft, shouldn’t you? while providing the cleanest, freshest laundry you’ve ever experienced! around your home. Improve your Quality of Life with a RainSoft water treatment system! 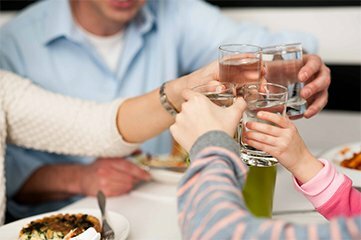 For great-tasting drinking water, the luxurious feeling of soft water, and the many benefits associated with cleaner indoor air, there is one company that families across North America trust – RainSoft. Since 1953, it has been our mission to take the worry out of water, and to help our customers rid their homes of airborne contaminants. We offer home water softener systems, drinking water filtration systems, whole house air cleaner systems, problem-solving water filtration systems, and many other premium products. Combined or individually, RainSoft products can dramatically improve the quality of life inside your home. A comprehensive RainSoft package can include* a whole house water filtration system, which removes chlorine taste and odor; a home water conditioner that takes out “hardness” minerals like calcium and magnesium; a drinking water filter system to provide better-tasting, healthier water; and a whole home air purifier that effectively neutralizes many bacteria, viruses, mold, and odors. We can tailor a RainSoft solution specifically for your family. Your authorized RainSoft dealer can install a water conditioner system with a capacity that is appropriate for your family size, home size, and local water quality, as well as a problem-solving filter to remove any contaminants that may be present in your specific water supply. Of course, the reasons for needing a home water purification system in the first place differ from homeowner to homeowner. Some families are fed up with drinking foul-tasting water, while others dislike the effects of hard water, such as dry, itchy skin, water-spotted dishes, faded clothing, and unsightly soap scum and water stains. Whatever water quality problems you may have, a RainSoft water treatment system can fix them. Plus, your investment will pay for itself over time. For example, our drinking water systems produce fresh, highly filtered, ready-to-drink water, eliminating the need for expensive bottled water, and our water softener systems can prolong the life spans of household appliances such as dishwashers, water heaters, washing machines, and ice makers. There are many advantages to purchasing a home water treatment and air purification system from RainSoft. First, many of our products – from our whole house water filtration system to our water softeners and drinking water systems – are Tested and Certified by the Water Quality Association or NSF International for their contaminant-reduction capabilities. This is an assurance to you, our customer, that our systems will perform exactly as promised. Second, all RainSoft water softeners, water filters, under sink drinking water systems, and air purifiers are assembled in the U.S.A. Third, every authorized RainSoft dealer provides expert installation as well as after-sales support. Our Limited Lifetime Warranty, which applies to all products, means that your RainSoft drinking water purification system, water conditioner system, problem-solving water filtration system, and whole home air purifier will be the last you will ever need to buy. And, you can even take them with you if you move. For decades, RainSoft has developed innovative products designed to make good water better, and has forged a reputation for being the nation’s top home water treatment and air purification company. To schedule a complimentary in-home water hardness and drinking water test, as well as a detailed product demonstration, contact a RainSoft dealer near you. ** Specific product packages and offerings vary by dealer.